Enjoy Fort Wayne MoneySaver Magazine! 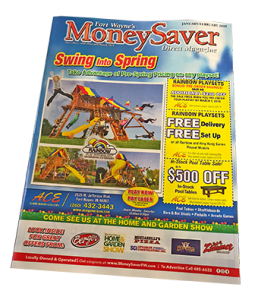 Fort Wayne’s Money Saver Direct Magazine is a glossy, upscale direct-mail savings publication mailed to Fort Wayne area homes via the mailbox. Money Saver is filled with coupons and money saving offers from dozens of local Fort Wayne and regional Indiana businesses. View our current coupons online or follow us on social media. We offer weekly contests and tips for saving money at local Fort Wayne businesses! Enjoy our coupons on your phone while you shop! Save big with our home improvement and lawn care offers! Each month we have plenty of pizza coupons! Enjoy Fort Wayne dining with our coupons! We can help you get your message to over 70,000 households in the Fort Wayne area!